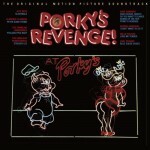 If you don’t remember, or never knew, the film Porky’s Revenge, don’t be surprised. As the third film in the Porky’s trilogy (filled in the middle by Porky’s II: The Next Day), its sophomoric humor was a tired rehash that had little of the original film’s raunchy charm. What this sequel did have is an inexplicably fine period-influenced soundtrack piloted by Dave Edmunds and stocked with A-list talents that include Jeff Beck, George Harrison, Carl Perkins, Clarence Clemons, Willie Nelson, Robert Plant, Phil Collins, Slim Jim Phantom, Lee Rocker and the Fabulous Thunderbirds. Edmunds was initially hired to produce only the film’s theme song, but he grew the project into a full original soundtrack – the only one of the series. And by selecting songs and then drafting friends and colleagues to perform (including a backing band of Chuck Leavell, Michael Shrieve and Kenny Aaronson), he elevated the soundtrack well beyond the artistic qualities of the film itself. At the time of the soundtrack’s mid-80s recording, Edmunds was a few years past a commercial run that began with 1979’s “Girls Talk.” But he’d maintained his well-earned reputation for modern-edged roots music, and had recently worked on projects with the Everly Brothers and the Sun class of 1955, Johnny Cash, Jerry Lee Lewis, Roy Orbison and Carl Perkins. This entry was posted on Sunday, June 22nd, 2014 at 6:30 pm	and is filed under CD Review, Reissue. You can follow any responses to this entry through the RSS 2.0 feed. Both comments and pings are currently closed.